Over the years a dynamic community has grown up around Tribal Spirit, drawn by its values of acceptance and compassion for all people. The ethos of Tribal Spirit has been to use music as a force for good - as an opportunity to learn the skills of a healthy, harmonious community. As the music is always created by a team, it becomes a joyful exercise in seeing how everyone can create together. There is never any individual star, but through cooperation and support, a beautiful whole is made which everyone can take credit for. The music is always more than the sum of its parts. Simply put - it wouldn't be the same without you there. A part of learning how to play music properly is learning how to listen how it all fits together as a whole. Each particpant has to learn to listen actively to their neighbours and to hear how their contribution fits beautifully into the whole. 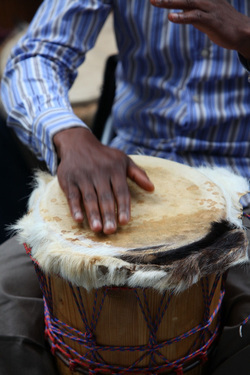 Classes give participants an opportunity to create music which is usually far more ambitious than they may have thought possible for themselves. As not many people consider themselves 'musicians' it can be a great surprise to discover what they have been part of. Most people think of themselves a consumers of music, rather than creators. It is a huge confidence boost for people of every age to be on the side where the magic happens. 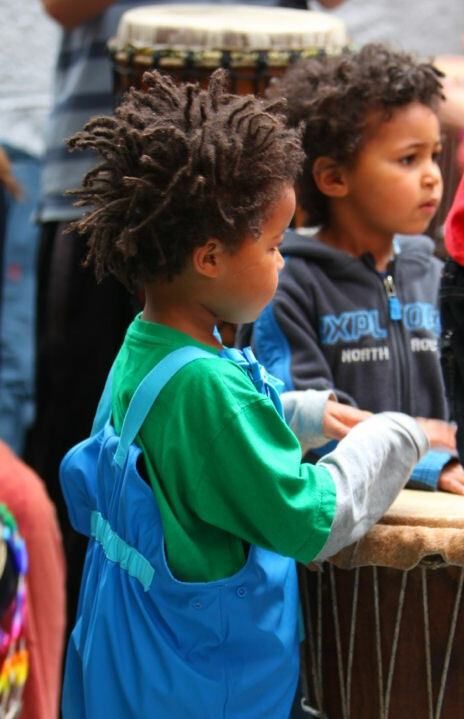 There is a closely-held ethos of non-judgmental support which is a very important element of all Tribal Spirit Drumming events. Even though every event will include people of very varying skills, no one will ever be put on the spot or criticised for their ability. Everybody's contribution is celebrated and encouraged. 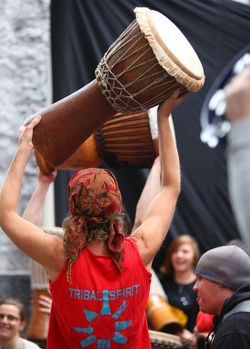 All Tribal Spirit Drumming events are strict alcohol and drug free zones. The emphasis is on offering teenagers and adults the chance to re-experience the naturally-occurring joy that comes from creating great music with others. This also means that Tribal Spirit events are very suitable for children and families.